Dmitry Litovkin: "The commander's first objective will be to destroy the militants near Palmyra." 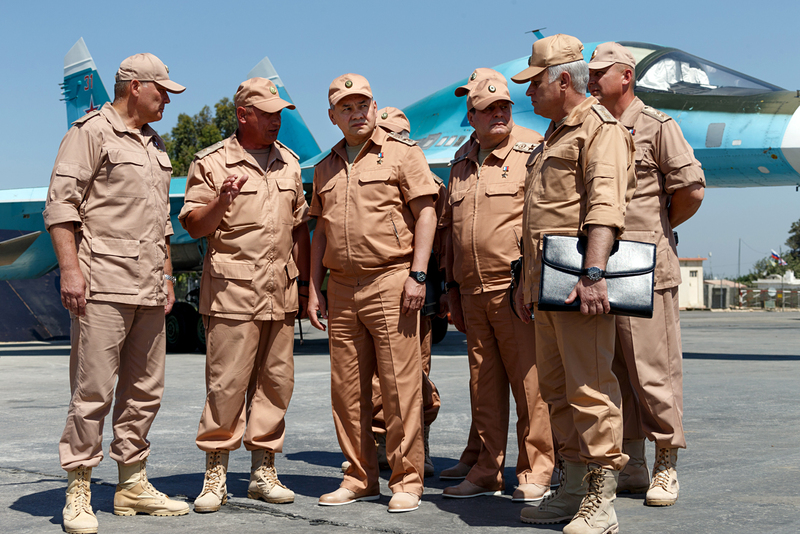 Photo: Russian Defense Minister Sergei Shoigu, third left, visits the Hemeimeem air base in Syria, June 18, 2016. Lt. Gen. Alexander Zhuravlev is expected to change the course of battle with Islamic State (ISIS) militants, who are advancing towards Palmyra once more. The Russian business daily Kommersant reports that Lieutenant General Alexander Zhuravlev, first deputy commander of the South Military District, has been appointed commander of the Russian forces in Syria. According to military observer Dmitry Litovkin, the new commander graduated from the Academy of Armored Tank Troops 20 years ago and worked his way up from chief of staff of a tank regiment to commander of a motorized rifle division in the Far East. The "transition" during the change of commanders of Russia's Aerospace Troops in Syria (the former general commander was promoted for changing the course of the civil war – RBTH) was difficult for the governmental forces of Syrian leader Bashar al-Assad. During this period the militants from ISIS, who were on the defensive, began an offensive in the suburbs of the central city of Palmyra and broke through several outposts in the city's eastern peripheries. "The commander's first objective will be to destroy the militants near Palmyra. For this the Russian Defense Ministry has already used a group of six Tu-22M3 strategic missile-carrying bombers, each of which carries eight tons of high-explosive bombs," said Litovkin. The strikes were carried out on July 12, 14 and 21 in the eastern suburbs of Palmyra in the regions of Es Sukhne and Arak. Litovkin explained that because of the militants' advance the Russian General Staff also plans to deploy the Tu-95MS and Tu-160 strategic missile-carrying bombers. In October the aircraft carrier Admiral Kuznetsov also joined the operation in Syria. The ship is carrying about 10 Ka-52K Kartan helicopters, which will be used in the conflict for the first time, as well as 15 Su-33 and Mig-29K/KUB fighters.